Calendar Only – Epistle XII (PDF) or click here for Calendar webpage. Liaisons, Clerks, and Representatives: Please distribute this epistle widely. Consider reading it aloud at Meeting for Business and including it in your newsletter. Thanks! Greetings, Pacific Yearly Meeting Friends! I’ve just returned from an invigorating week at Quaker Oaks Farm so excited to tell you about the Spring Youth Service Learning Camp put on in partnership with the local Wukchumni Tribe. 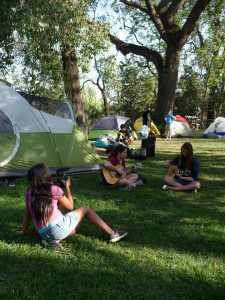 Teens and adults enjoyed games, archery, crafts and camping together in our tent village on the Visalia meetinghouse lawn. 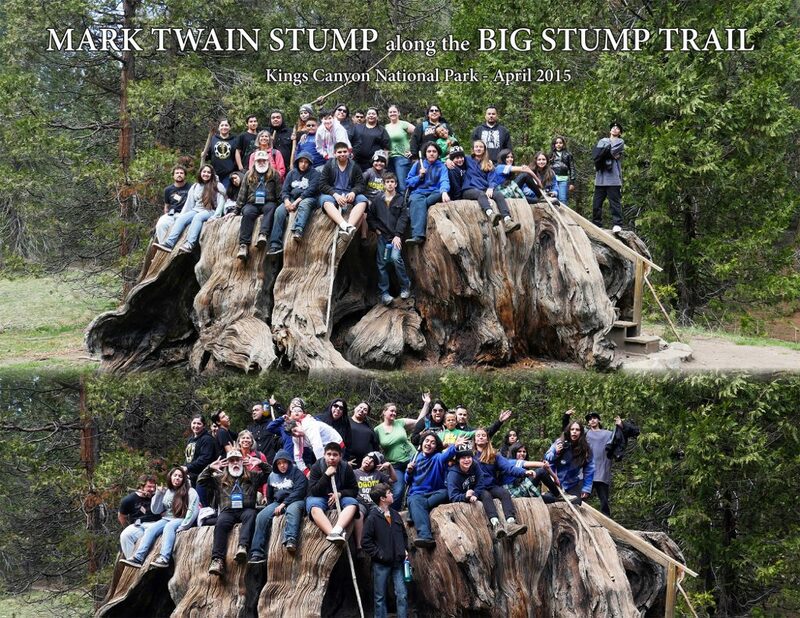 We journeyed to Kings Canyon National Park to visit our ancestor trees, the giant sequoias. On the last day, we helped rebuild the Wukchumni sweat lodge in a new location, as is done each springtime for the new year, and some participants experienced their first sweat. Half of us stayed even longer to join in the Wukchumni Spring Ceremonies and the Visalia Friends Easter breakfast and meeting for worship under the farm’s namesake Valley Oak. Campers told us, “I learned more about Native Americans in a day here at camp than in my whole time in school!” and “it’s so nice to be out in nature this week instead of at home in the city.” Others asked lots of questions about Quakers, learning why ‘Quaker’ used to be a derogatory term or wanting to know more about Friends’ use of silence. Many were sad for camp to end, and we heard lots of ideas for how to make camp even better next time because they want to come back. At camp, 17 teen-aged campers and about the same number of staff and elders, including Friends, Wukchumni Yokuts and other Native Americans from the Fresno American Indian Health Project spent four days building community through shared learning, play, meals and even chores. A day camp for younger children also attracted a variety of enthusiastic participants. 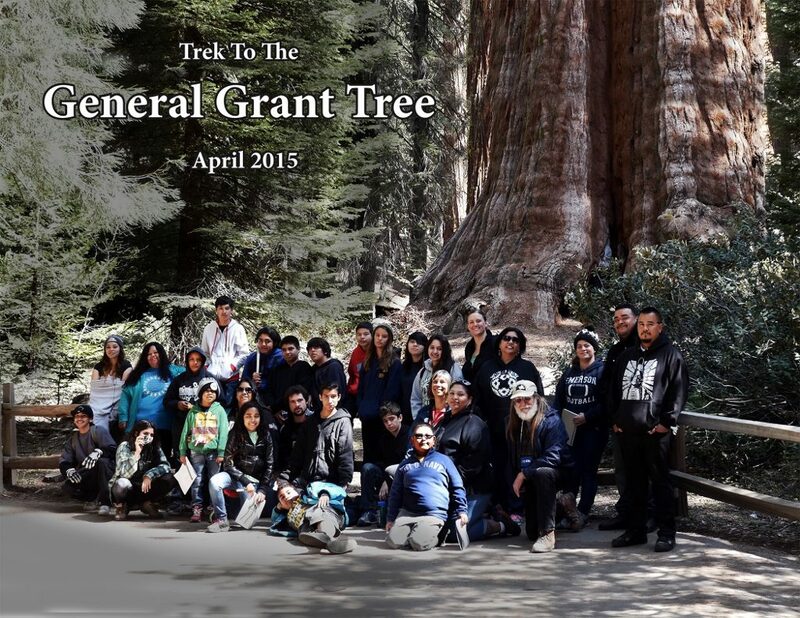 Besides spending a refreshing amount of time outdoors in this rural part of the lovely California Central Valley near Visalia, we engaged in core activities of the “Gathering of Native Americans (GONA)” curriculum, an experiential learning module in some ways similar to Alternatives to Violence Project (AVP). We were fortunate to also have Woolman Semester alum Genevieve Kules, now a student at Pitzer College, lead a participatory video and photography project to document the camp experience; she will continue working with campers to finish their digital stories and produce a short documentary. Quaker Oaks Farm board members and the camp planning committee expressed much gratitude for the support received from our PYM Youth Programs Fund (Bob Vogel Endowment) and other contributions that helped make this amazing gathering possible. The YPC Committee will be co-hosting an interest group at Annual Session about this ongoing collaboration at Quaker Oaks: come hear about this intercultural, intergenerational work toward restorative justice and our developing relationships with this ancestral Wukchumni land now held in trust by Visalia Friends Meeting and managed by Quaker Oaks Farm nonprofit. Be on the lookout for more about this unfolding story an upcoming article in Western Friend by Farm board members Darlene Franco (Wukchumni Tribe chairwoman) and Melissa Lovett-Adair (Central Coast Friend). Attached is a current calendar of events. It’s also linked from pacificyearlymeeting.org/youth . In addition to the list-style calendar, you can now view or subscribe there to a Google calendar. Funding and Support for Bright Ideas: Have an idea for an event or project that can’t be funded otherwise, or need some help with design and implementation? Our YPC Committee manages the Youth Programs Fund (interest from the Bob Vogel Endowment) and is available for consultation. The next request deadline is June 20 for funding in July 2015. We accept applications on a rolling quarterly basis (March 20, June 20, September 20, December 20), with decisions within a month. We are open to requests for other forms of support at any time, and we’ll have designated times at Annual Session to familiarize you with the process and brainstorm ideas. Descriptions of the fund’s purposes, policies and application are online at pacificyearlymeeting.org/youth/resources-funding . Read more about the work of the YPC Committee in our YPCC report to Representative Committee from the end of February, where committee clerks and PYM officers came together to plan for Annual Session and address pressing items of business: pacificyearlymeeting.org/2015/documents/ypc/youth-programs-report-to-repcom-2015 The Young Adult Friends co-clerks and the Junior Yearly Meeting (teen and adult committee members) also met in conjunction with RepCom to plan their activities for Annual Session. Registration for PYM’s Annual Session will be opening very soon. Watch the PYM website for updates, and ask your Meeting’s PYM Rep if you have any questions. Register early to get the best rate. Financial assistance is available – if you need it, ask! Gatherings such as Spring Quarterly Meetings (SCQM 4/25 in La Jolla, and CPQM 5/15-17 at Quaker Center), family camps at Woolman and Quaker Center, and PYM’s Annual Session include fun and spiritually deepening activities and community-building for all ages. Connecting with Friends at the regional level is especially helpful for young folks who don’t have a large peer group locally and for newcomers and experienced Friends alike. Please remember my open invitation to consult with your Worship Group, Meeting, organization, or committee. Looking forward to seeing Orange Grove, La Jolla, and Friends House folks soon! Spring Quarterly Meetings: There’s funding available for teen intervisitation between SCQM and CPQM. Ask your QM teen program clerk (Kathy Runyan or Kate Watkins). Thanks, Bob Vogel Endowment! Summer Camps: Registrations are now open for Quaker Center, Woolman, and Mountain Friends camps. 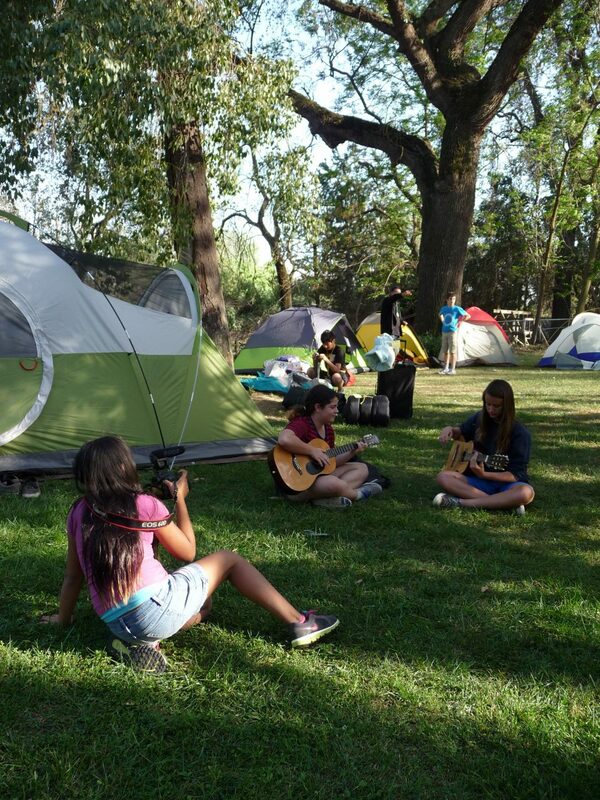 Quaker Center’s Peace Action Camp will be held in Sacramento this time, including outdoor adventure and working with the Friends Committee on Legislation of California. Woolman’s Teen Leadership Camp is now offering sessions focused on hiking, farming/cooking and bike touring/repair. Have you seen the recent article on “Radical Vulnerability” by two of our YAF co-clerks, Elena and Kylin, on p. 26 of the latest issue of Western Friend (Mar/Apr 2015)? 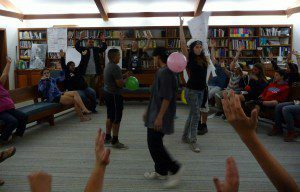 YAFs have been organizing leadership-, community- and skill-building events with help from the Youth Programs Fund. See your YAF webpage for details. 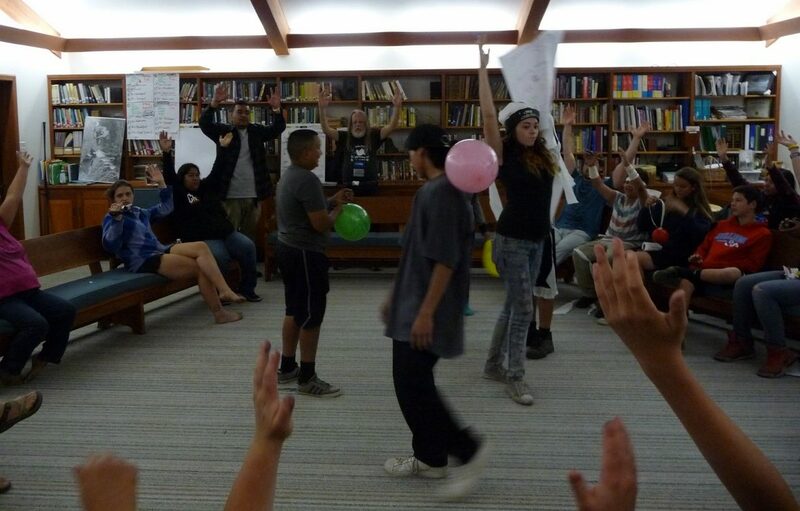 On March 13-15, YAFs hosted an Alternatives to Violence Project “Basic Training” at the Berkeley Meetinghouse and are considering a follow-up workshop and other similar activities. Many thanks to the AVP facilitators who donated their time and expertise: Vicki Carroll (Central Coast), Stephen Matchett (San Francisco) and Sue Torrey (Central Coast). Again this year, YAFs will host a YAF & Elders Retreat during the weekend prior to PYM’s Annual Session (July 10-13) at the Berkeley Meetinghouse, and all are welcome to join in this weekend of service, spirit, and fellowship; the 2015 PYM Annual Session keynote speaker, Lloyd Lee Wilson, and invited guest Paula Palmer will also be attending. Called to serve as a camp counselor or FRAP? Have some experience you’re willing to share with others? Sign up for our Adult Allies to Youth Workshop: April 18th or May 2nd! See calendar for details. Adult Allies to Youth Workshops: 1) at Orange Grove Meeting, April 18, 10AM-5PM, and 2) at Friends House in Santa Rosa, May 2, 10AM-5PM. Contact Alyssa Nelson. JYM will be looking for Friendly Responsible Adult Presences for day and evening shifts at Annual Session. Contact adult JYM co-clerk Sue Torrey (Central Coast) or keep an eye on the adult allies webpage. PYM will also be looking for Children’s Program Teachers. Contact CP clerk Heather Levien (Berkeley). Youth Programs Coordinating Committee members: Lynnette Arnold, Jennifer Carr, Mary Klein (co-clerk), Steve Leeds, Stephen Myers, Kylin Navarro, Thomas Rios, Jim Summers (co-clerk). Two youth slots are vacant. Inquire within! Click here for Calendar webpage.